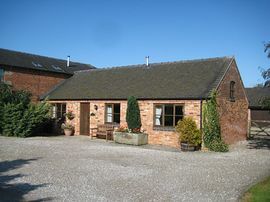 Brun Farm Cottages are a range of delightful barn conversions situated on a working sheep farm. The location offers the best of both worlds - a beautiful rural setting, yet only a 5 minute drive from the City of Derby. The cottages are available for weekly holiday bookings, or longer lets, for those on business trips. THE CART HOVEL is particularly popular with holiday guests as it is single storey, with 2 ground floor bedrooms, each with its own bathroom. The cottages are cosy and warm, fully centrally heated and double glazed and each has a comprehensively equipped kitchen. There is ample parking and the large gardens overlook open fields, with views towards the National Trust's Kedleston Estate. Bed linen and towels are provided in the price, as are all fuel bills. In addition to the two holiday cottages we also have smaller studio flats, designed for the long-stay business guest. These are available from as little as £100 per week. All accommodation is presented to a high standard in terms of cleanliness and rooms are regularly redecorated and refurbished. Probably the most conveniently situated cottage for those visiting Derby. Bed linen and towels provided at no extra cost. Large shared gardens and private patio for each cottage. Picnic tables and benches. When leaving Derby, follow signs for Ashbourne on the A52. After approximately 2.5 miles, turn left into Brun Lane. Brun Farm Cottages are about a mile from the A52, on the right hand side of Brun lane. Low season: £180.00 - £280.00. High season: £300.00 - £360.00. Long stay lets: from £100.00 per week.